Any discussion about Net Neutrality locally (that is the Zero rating kind we worry about here and not the internet superhighways one they worry about in the US) gets emotive pretty fast. Articles we write here get a lot of comments from people that, either strongly feel operators like Econet and their OTT partners have a duty to play fair, or they strongly feel that operators that have invested money in network infrastructure, should model access however they see fit to advance their profit mission. To be clear, it’s hard to find the perfect arrangement that would 1) be fair to operators, 2) promote access for subscribers that cannot afford basic connectivity, and 3) at the same time create a level playing field for internet entrepreneurs looking to access these subscribers. After all, mobile operators are indeed in it for the profit so any proposal that comes from the activist position of appealing that they show more concern for the welfare of other businesses, is unhelpful. I’ve been guilty of this myself, letting my belief in the internet get in the way of practical business matters. 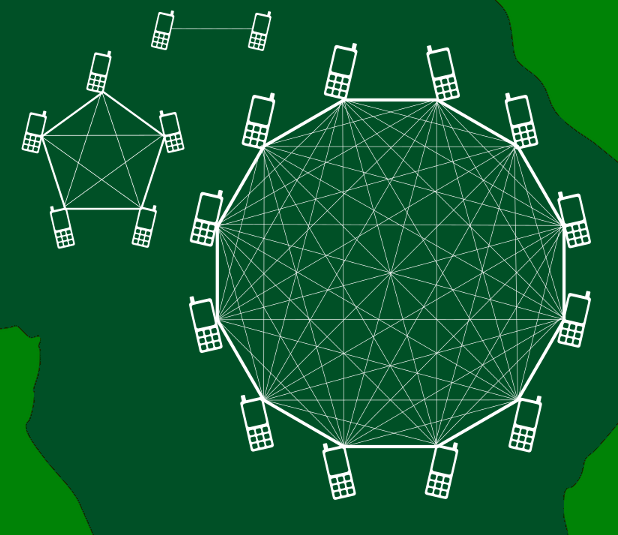 What if it were normal for all MNOs to offer low-bitrate, generic Internet access in the same manner that all MNOs connect phones to their network? Let’s imagine that Internet data were enabled by default for free at GSM (2G) speeds of only 9.6kbps to all users. Let’s also imagine that it is a best-effort service that might not always achieve that speed or may have terrible latency, a bit like real 2G service. A million users consuming 2G at a modest 4.8kbps would consume about 4.8gbps per second of capacity. Looking at the adult population of South Africa of roughly 35M people, if everyone were consuming that data on their phones at one time, it would amount to 168 gbps of capacity across the entire country. Let’s put this in the context of South Africa’s undersea fibre optic cable capacity, which currently has an aggregate design capacity of 17 tbps, soon to reach 22 tbps when the ACE cable lands. Free 2G data for all would consume less than 0.01% of the design capacity of the international submarine cables landing in South Africa. Song admits that the basic proposal may have many flaws but I agree with him that its certainly worth exploring and at the very least piloting on a network to see how consumption behaviours change and what the impact on profitability would be for the operator. It’s somewhat similar to Facebook’s opening up of their free basic platform to developers so any site/app can be zero rated, but the key difference is that this is not controlled by a few global players and that it doesn’t need a new platform for everyone to start to developing for. Song’s proposal is just a simple basic slower internet for all. Read the full article here which includes more on how this would work and what the benefits would be. Curious to hear your thoughts on it, especially if you work for or with an mobile operators. Zimbabwe is a perculiar and strange place to propose anything that needs vision and hardwork!! Before we even start to talk of zero rating, net neutrality etc, we need stable, reliable and countrywide infrastructure with broadband or basic internet access. You have to ask yourself, is this possible? Can a company go on this massive investment only to be told to provide free access? But before you get at company level, you need to look at gvt level vision. Telcos are being charged tax everywhere, expensive licensing fees, massive duty on purchased equipment for infrastructure. Now, again, ask yourself if the gvt have right vision to grow this sector? How do survive as a company in country where gvt is seeing taxing as its main form of survival and cash cow? Until we get a gvt or minister with the right vision, we will be at the mercy of telco(s) which are managing to survival gvt taxation, and at the moment, they are not many. Other telcos are only surviving because they are not paying their dues. Do you understand ROI? That is what businesses consider first not socialist theories. finally some sense. The slight problem here is that unlike SA Zimbabwe doesn’t have access to inexpensive international bandwidth so I’m not sure the proposal would apply to landlocked countries like ours. Zimbabwe has about 5 million people using the internet and just taking those and and multiplying by the given 4.8kbps is 24 gbps of bandwidth. Don’t know the specifics but isn’t that not more than the internet we get as a country right now. Econet is making money on that 4.8kbps so why leave it on the table?